In 1944, a new type of armored vehicle, designed specifically for use by the Royal Engineers (RE), entered service. This was the Churchill AVRE (Armoured Vehicle Royal Engineers). It was based on the Mk. III and IV model of the Infantry Tank, and was famously armed with the devastating 290mm Petard Mortar. The AVRE stormed the beaches of Normandy and fought right up to the end of the War. It even destroyed a German Panther tank along the way. Action after action, the AVRE proved to be a devastating weapon. It became feared by its enemies and trusted by its allies. Such was the success of the original vehicle in the Second World War that, between 1947 and the early 1950s, 88 of the later Mk. VII Churchills were converted into a new, improved version of the AVRE, which was designated the FV3903. Even with this new generation, though, the Petard armed AVREs continued to serve until 1964. The designation of the vehicle was changed, however. The original nomenclature, ‘Armoured Vehicle Royal Engineers’ would be replaced with ‘Assault Vehicle Royal Engineers’. Known as the ‘Heavy Churchill’, the Mk. VII began life in 1943. It was much more heavily armored than previous models, with armor up to 152 mm thick, as opposed to the 102mm of previous models. This gave the tank far more protection against the infamous German 8.8cm guns, as well as their many other high penetration guns. The biggest change, and one of the main identifiers of the Mk. VII, was its heavy cast turret, the face of which bore that 152 mm thick armor. The main armament normally consisted of the Ordnance QF 75mm tank gun, with a secondary armament of a coaxial and bow mounted BESA 7.92mm machine gun. Another identifier is the round hatches on the side of the tank, usually square on previous models. The crew of the Mk. VII consisted of five men. These were the gunner, loader, commander, driver, and bow gunner. The biggest change came with the weaponry. The trusty 290mm Petard mortar was replaced with the new Ordnance BL 6.5″ Mk I. This 165mm bore demolition gun was a breach loader, a vast improvement over the Petard. The gun fired a 64 lb (29 kg) High Explosive Squash Head (HESH) shell up to 2,400 m (2,600 yd). Thirty-one rounds of ammunition were carried in the tank. The gun was initially tested against various sizes of concrete blocks, and oil barrels filled with concrete. It succeeded in pulverizing almost all of these targets. The gun was reportedly accurate enough to blast a bridge girder at 600 yards (549 meters), or hit a pillbox or bunker at 1400 yards (1280 meters). At greater ranges, it was an effective Area-Of-Effect (AOE) weapon. This was a huge range increase compared to the 100 yards (91 meters) range of the Petard. The round had no shell case in the traditional sense. 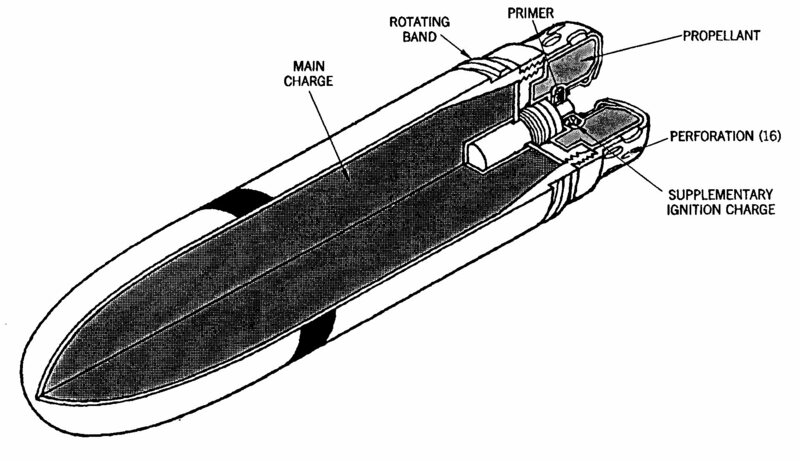 Instead, the charge was placed inside a perforated base connected directly to the warhead that remained attached in flight. The gun had an elevation arc of -8 to +15 degrees. 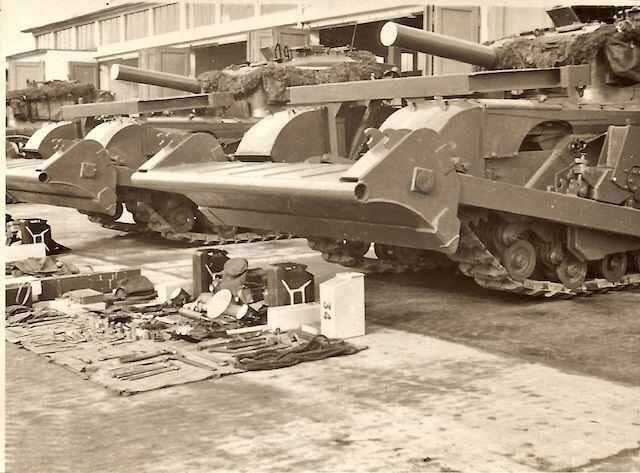 The original gun used a basic barrel while later models of the AVRE would use an upgraded version with a large fume extractor placed half way along the gun tube. This version of the gun was likely the test bed for the L9A1 used on this vehicle’s successor, the Centurion AVRE. It is not clear what internal modifications took place inside the turret, but there were also external changes to the turret face, specifically the mantlet for the gun. The face was flattened by removing the bulges in the armor around the base of where the 75mm barrel would be on the standard Mk. VII gun tank. A new circular cut was made to accommodate the 165mm barrel. The standard BESA coaxial machine gun was removed on this vehicle, but the void in the turret face that would allow it to travel through its elevation/depression range was retained to allow the gunners sight to be added. Furthermore, a weatherproof canvas cover was added to the turret face and around the base of the gun barrel. When not in use, a canvas cover could be placed over the muzzle of the gun. Two banks of six-tube smoke dischargers were added to the turret sides, one on the left and one on the right. 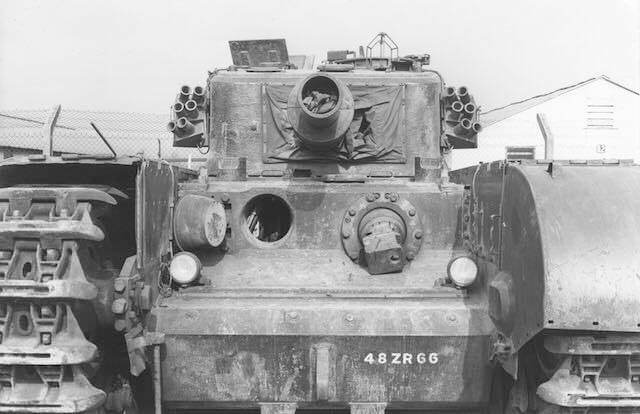 On the back of the AVRE’s turret, on both sides, large loudspeakers were added. These were added to communicate with any following infantry. It is not clear why these were added exactly, especially as the Churchill VII had infantry telephone (‘grunt phone’ in the US) fitted to the back of the tank as standard. It may be that this was used to communicate with a whole infantry squad at once, instead of a single man with the telephone. 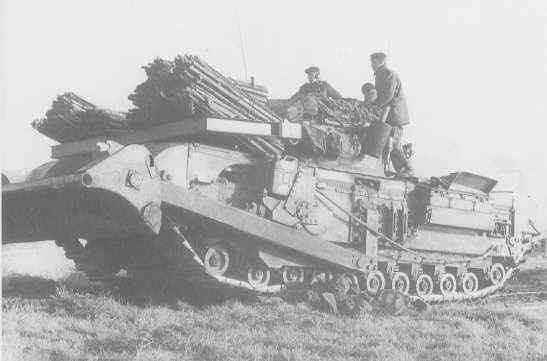 AVRE with dozer blade, the fascine cradle is full of bundles of an unknown material. Photo source unknown. The new AVRE’s primary role would not differ from the original. It would use its gun to breach and destroy obstacles and fortifications. Also, like the original, it could fulfill a number of other roles thanks to a vast array of equipment types carried over from its World War Two counterpart. On the side of the AVRE were mounting points for the 3 ton Dozer blade. It would be fixed in place just above the fifth roadwheel, with hydraulics mounted over the second and third wheels that could raise and lower the blade. The blade was used to carve out hull-down positions for gun tanks, dig gun emplacements, flatten rough ground or create and fill anti-tank ditches. It could also be used aggressively to push barricades or debris and landmines from the path of attacking allies. Just like the original AVRE, a large fascine could be carried over the front end of the tank in a cradle mounted over the driver’s position. Fascines had been carried by tanks since their earliest days on the devastated battlefields of the First World War, most notably at the Battle of Cambrai in 1917. Fascines are used to fill wide trenches or ditches to allow tanks to cross. They were usually fabricated from brushwood, bound tightly together into a cylinder. They were usually 15ft (4.5 m) wide and 6-8 ft (1.8 – 2.4 m) in diameter. The fascines were held on the tank via cables. To deploy, the tank would drive up to the edge of the offending ditch or trench. The fascine would then be cut free, and the whole thing would be tipped forward by the cradle, filling the gap. The AVRE would then drive over the fascine ahead of the gun tanks to clear the way or the advance. A development of the World War Two ‘Conger’, the ‘Giant Viper’ was a mine clearing device used to clear large areas of explosive devices such as IED’s or landmines, or clear a path through barbed wire. The Viper was mounted on a trailer that was towed by the tank. It consisted of a 750ft (229 m) long, 2 ⅝ inch (6.6 cm) diameter hose filled with plastic explosives. The Viper would be launched over the tank via a cluster of eight rocket motors. The blast would clear a pathway 24t (7.3m) wide and 600 ft (183 m) long. Despite work beginning in 1947, this new AVRE did not enter service with the Royal Engineers until 1954. 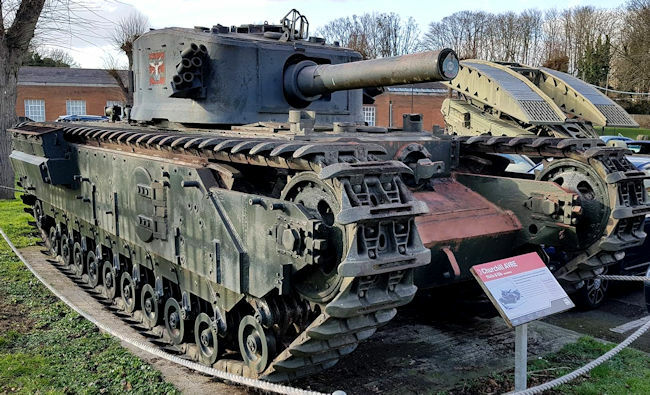 The AVRE was one of the last types of Churchill to serve with the British Army, superseded only by the mine-clearing FV3902 Churchill Toad which was produced up to 1956. 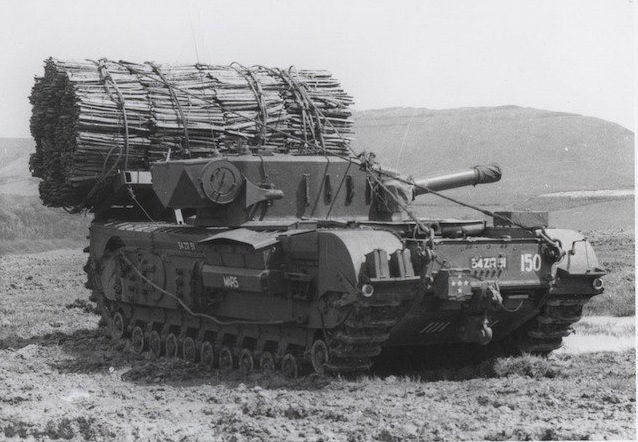 The Churchill AVRE was removed from service in 1965. This use of the tank brought the total service life of the Churchill tank up to an impressive 24 years. Unfortunately, more is not known about the vehicle’s time in service. As far as it is known, they were never used in combat. By 1955, work had begun on its replacement, the FV4003 Centurion AVRE which then entered its lengthy service life in 1963. A few of these later AVREs do survive today. For a time, one was kept at the Tank Museum, Bovington. One can be found at the Royal Engineers Museum in Kent, England. For a short time, one could be found along the last surviving Toad at the Littlefield Collection in the USA. After the museum’s closure in 2014, the collection was sold off. It is not known what happened to the AVRE, but the Toad ended up at the Australian Armour & Artillery Museum. Haynes Owners Workshop Manuals, Churchill Tank 1941-56 (all models). An insight into the history, development, production, and role of the British Army tank of the Second World War. 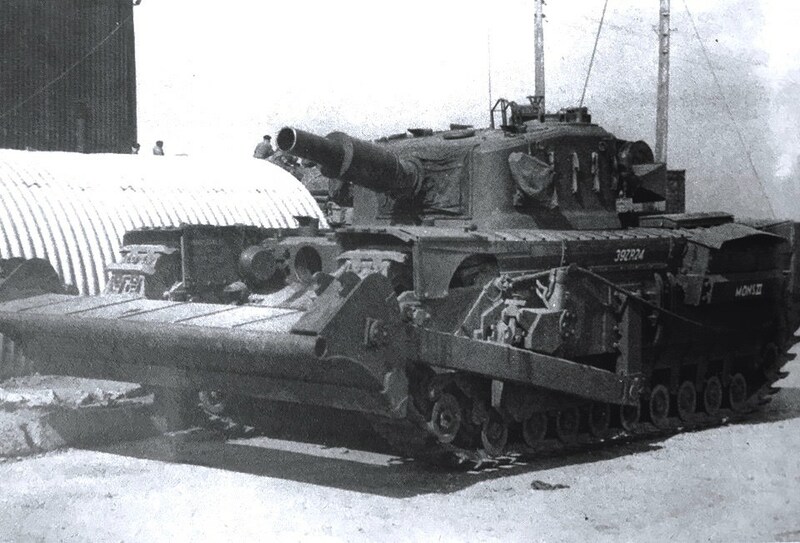 FV3903 Churchill AVRE ‘MARS’, outfitted with Dozer Blade. ‘MARS’ was one of the earlier models, signified by the lack of fume extractor on the gun. Illustration by Tank Encyclopedia’s own AmazingAce, based on work by David Bocquelet. I would have thought the advantages of speakers is that it would allow them to proactively communicate with nearby infantry rather than wait for someone to approach the infantry phone. That is the reason I believe.